Piqua’s Mick Karn intercepts a pass in front of Lima Senior’s Jaleel King in the first quarter. Piqua’s Zayne Arbogast blocks against Lima Senior Friday night. Jerell Lewis blocks for running back Makeegen Kuhn. Piqua’s Owen Toopers looks to eleude a Lima Senior tackler as teammates Trenton Foster (49) and Ca’ron Coleman (25) set up blocks. 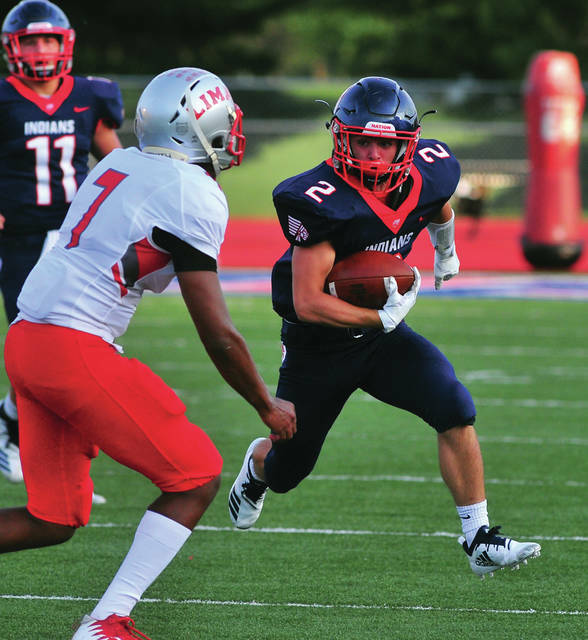 Piqua’s Colin Roe looks to turn the corner Friday night against Lima Senior. 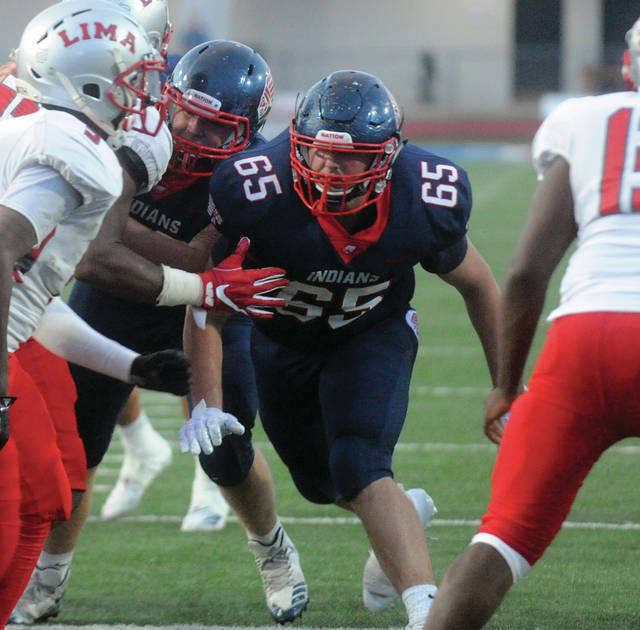 Piqua and Lima Senior came into Friday night’s game at Alexander Stadium/Purk Field looking to even their records after an opening week loss. And it was Piqua who was able to do exactly that, defeating the Spartans 26-6 in the Indians home opener. After the teams traded three-and-outs to open the game, Piqua made the first big play of the game. After Lima Senior picked up its first first down, Piqua’s Mick Karn picked off a halfback pass at the Piqua 38. Piqua put together a 62-yard drive to get on the board first. Matt Blankenship and Karn both had short runs for first downs, before Karn threw 18 yards to Owen Toopes from the Lima 36. A face mask moved the ball all the way to the nine-yard line. After a three-yard run by Karn, Colin Roe ran five yards to the one-yard line. Karn ran it in from there and after a mishandled snap on the PAT, Piqua led 6-0 with 2;03 remaining in the first quarter. It stayed that way until late in the first half. “It was good to get that first score, but then we kind of stalled out inside their 20 a couple times after that,” Nees said. 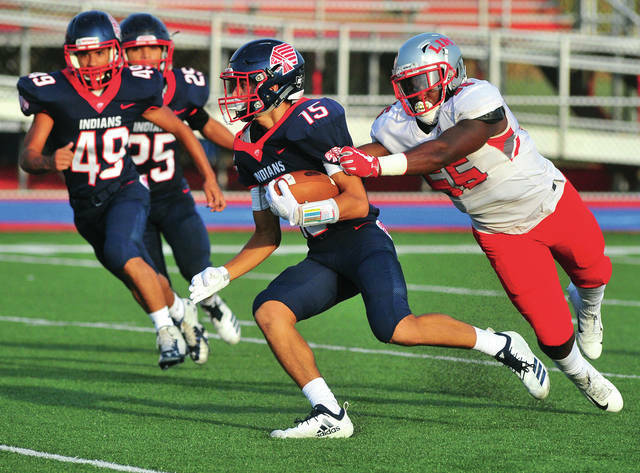 Piqua drove deep into Lima territory before Joquise Sheriff intercepted a pass on the Lima 21. That sparked a 79-yard drive. Lima quarterback Rasheed Wallace ran 29 yards out to midfield on the first play. He completed the drive with a 21-yard pass to Jaleel King for the score. The PAT failed and with 1:42 to go in the first half, the game was tied 6-6. On a first and 20 from the Piqua 20 after the kickoff, Karn ran 36 yards to the Lima 44 and Blankenship rumbled 16 yards on the next play. After a seven-yard pass to Owen Toopes, Roe ran 11 yards to the Piqua 10. Karn then hurdled a would-be tackler to get all the way to the one. Two plays later, Karn ran it in from four yards out. After the PAT failed, Piqua led 12-6 with less than 30 seconds to go in the half and took that lead to the locker room. “It was good, but it seemd like it was 12-6 forever,” Nees said. Lima opened the second half with Shannon Allan Jr. recovering an onside kick at the kick at the Piqua 34. Penalties stalled the drive and neither team could scored until the fourth quarter. Piqua put together a 67-yard drive late in the third quarter. 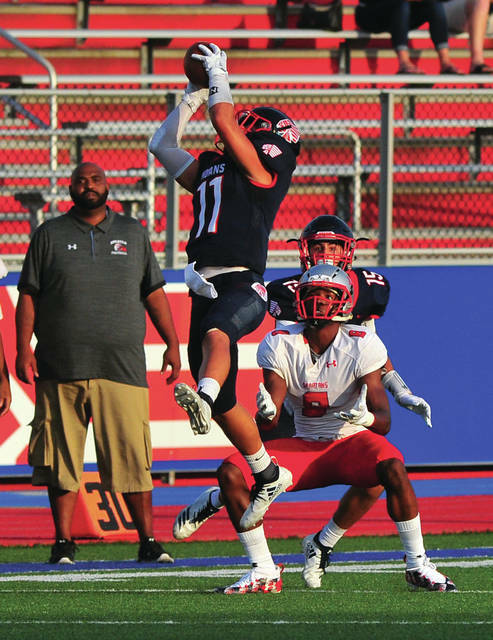 Karn had runs of 24 and 15 yards on the drive, before throwing a 19-yard TD pass to Roe on a fourth-and-15 play on the first play of the fourth quarter. Karn’s kick made it 19-6. “I felt like in the second half, (Mick) Karn just did an outstanding job of controlling the game,” Nees said. A Blane Ouhl interception set up Piqua’s final score. The Indians went 79 yards in 13 plays. “To put together a nine-minute drive to put the game away was just outstanding,” Nees said. Makeegen Kuhn had runs of 16 and 14 yards on the drive, before Jerell Lewis bulled in from the one-yard line for the score. Karn’s PAT made it 26-6. Lima put together a drive after the kickoff, but Karn intercepted in the end zone to seal the win. “I think what happened in the second half is we finally started to find a rhythm on offense,” Nees said. 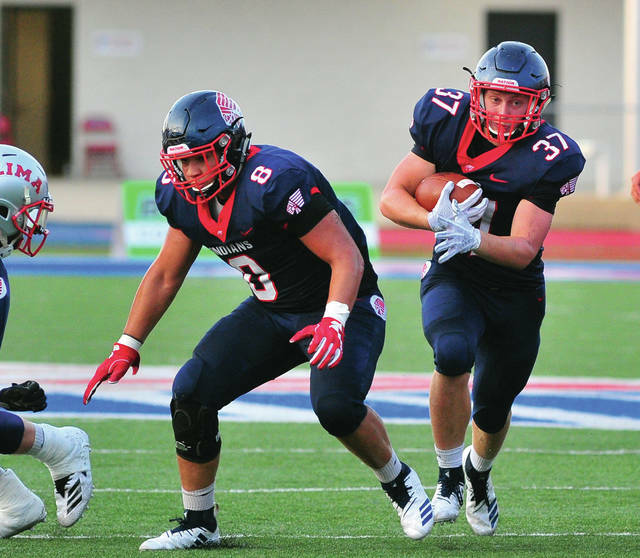 Karn led a balanced Piqua rushing attack with 109 yards on 18 carries. Kuhn had 58 yards on eight carries, while Ca’ron Coleman had 52 yards on six carries. Roe had 38 on six carries and Blankenship had 33 yards on eight carries. Karn completed six of 14 passes for 65 yards. Kraig Hemmert led the defense with six tackles and Owen Toopes had five. Wallace had 62 yards rushing on seven carries and completed 10 of 15 passes for 87 yards for Lima. King had five catchers for 60 yards and Jawan Anderson had eight carries for 40 yards. The Indians will be back in action Friday, hosting Meadowdale.